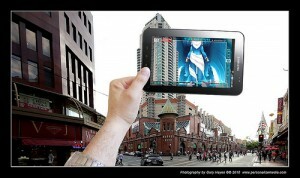 Example of an augmented reality game. The next generation of learners will have access to an astounding array of tools -- including augmented reality games. What's the purpose of this high-tech approach? To use “the world as the hook to get students interested in learning,” says Kurt Squire, the associate education professor at University of Wisconsin-Madison, in an article by Heather Chaplin in Spotlight on Digital Media and Learning. With the game "Dow Day," middle school students are able to see footage of Vietnam War protests on their mobile phones wherever they're standing on the UW-Madison campus. As opposed to traditional classroom environments, where the learning model is one of transmitting content, game-based pedagogies hold a situated, interactionist view of learning where players enter with understandings, identities, and questions, and through interaction with the game system, develop along trajectories toward more expert performance. Thus, educational games are systems of potential interactions (more or less) carefully orchestrated to guide user’s experience (and learning), with academic knowledge, skills, values, and identities developing as a result. Educators are experimenting with the technology -- some are even beginning to build apps on their own. Maybe by the time mobile learning and games become the norm, the industry may well be ready with the right tools.